A dramatic redevelopment of the existing customer enclosures behind the main grandstands. The proposals extend these rear enclosures, sweeping away the disparate collection of old, tired buildings that had grown organically and unplanned over a number of years. This allowed the area to be totally re-planned to introduce vastly improved customer circulation, with tree lined boulevards and to increase in the overall capacity of the Racecourse. 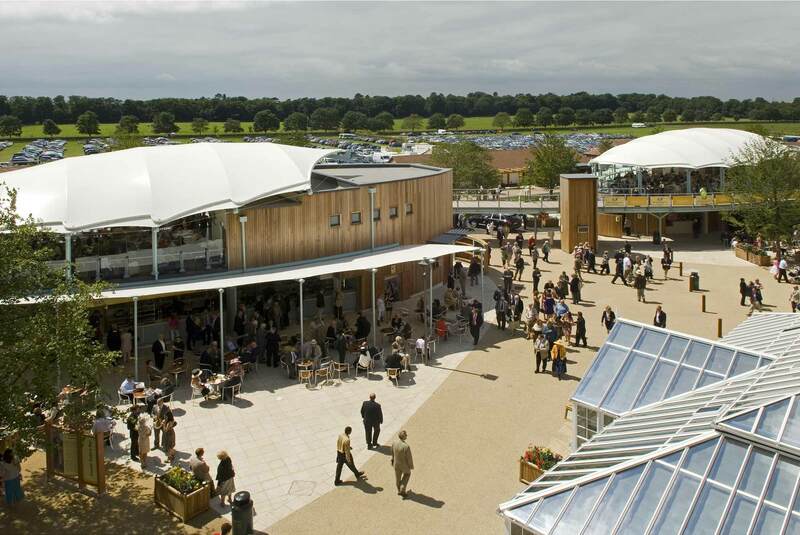 The Perimeter Buildings form a defined edge to the racecourse and included bar, food, betting and toilets facilities. Centrally in the enclosures, acting as focal point for customers arriving at the Racecourse, two new two-storey pavilions buildings provide al-fresco dining and further bars, betting and toilets facilities. At first floor these pavilions are linked by a dramatic, structural expressive aerial walkway, which adds a whole new dramatic experience and aerial dimension for the visitors to the racecourse.